This post has been languishing in the drafts for all of summer. I must have opened this post to edit at least two dozen times and closed it each time even before a few sentences trickled down. It just did not happen. A laid back recipe made of a generous handful of summer, a good measure of what is called ‘life’, a cup of lost mojo, a tablespoon of procrastination, a teaspoon of writer’s block beat the better of a pinch of my best intentions this past season. Given my liking for the dish, ideally, this should have been one of my first few posts on this blog. Nevertheless, in spite of a pot full of excuses I did manage to get the post together finally. Hope you’ll like it. My close friends ask me time and again, being an Iyengar how could I have not written about THE most iconic Iyengar dish – the majestic and ever popular PuLiyogare? After having shamelessly evaded those kind of questions long enough, I hereby put them to rest by sharing the recipe for authentic PuLiyogare mix, the first pre-requisite to making good home made PuLiyogare, a must to mark anything festive in our households. This is a recipe, the taste of which I have been familiar with all my life, the way it has always been made at my Taatha’s (grand dad) house and also the way my dear aunt makes even today. One does not have to be an Iyengar to be familiar with this spicy dish. Be it the zillion homesick IT professionals or anyone who has ever traveled out of India for the briefest time would have tried it at least once, thanks to MTR! To be honest, I have lived off of MTR Puliyogare powder / paste for a good part of my life and even now don’t mind a quick fix Puliyogare once in a while. And to be even more truthful, I have hesitated making traditional PuLiyogare for quite a while myself, given how elaborate the preparation is and would make it only if Amma or my aunt provided me the essentials – freshly prepared Puliyogare Gojju and Puliyogare mix, the King of South Indian spice mixes. MTR Puliyogare powder is pretty good alright. But, when you learn how to make the real thing, then quick fixes don’t cut it anymore. Well, you and I may not stop buying the MTR PuLiyogare mix, but it is always great to have an authentic recipe in your repertoire. That is how I am compelled to share this recipe with you. Why be deprived of good stuff? Making of the PuLioyogare is an art in itself. PuLiyogare as a dish is the epitome of delayed gratification, the making of which can roughly be divided into three phases. Phase I is making the spice mix, Phase II is the making / simmering of Gojju or tamarind paste and the last leg is the actual making of the PuLiyogare. Each Phase needs due diligence, is time consuming drawn, demands oodles of patience, but the end result is worth every single bit of laboring in front of the stove filling you with pride and satisfaction akin to any bread baker making a good artisan bread. Like they say, good things take their own time. PuLi (sour / tamarind) + Ohare (mixed rice) = PuLiyogare, is the food of the Southern Gods, the prasadam offered in Tirupathi devasthanams if you have ever paid a visit, you know what I am talking about. To pronounce it correctly, just twist your tongue backwards to touch the epiglottis when you utter the “Li” sound stressing on the bold “L”. No other sound li, lee, ly does justice. Do not mistake this with the Andhra Pulihara or Pulihora. Also, Puliyogare and Puliyodharai though ought to be same, are slightly different in taste being regional variations of Karnataka and Tamil nadu. It may surprise you to see that this home made Puliyogare mix is different from the store bought versions that you might be familiar with. The reason we make it this way is simple. On their own, the spice mix and the tamarind paste have a better shelf life than when combined. Combined with the oil, shelf life is limited as the oil turns rancid. Needless to say, starting with the best ingredients always yields best results. If you have made Mysore Saaru Podi or any Rasam Powder at home from scratch, this is as simple as that! Recipes for Puliyogare Gojju and making of the PuLiyogare will follow soon. Fingers crossed. The best way to roast the spices is to do it in batches preferably in the order mentioned starting with red chillies and end with mustard seeds. Heat oil in a kadai or wok and roast the red chillies on low-medium heat. Using two ladles, roast by lifting the chillies from the sides until they are very hot to the touch but not smoking. Let the chillies not burn or the pungent chilli fumes will take over the kitchen. Spread on a plate and keep aside. Next, add coriander seeds and curry leaves to the kadai and dry roast on low-medium heat until curry leaves are dry, crisp and crumble when pinched, but retain their green color and coriander seeds are aromatic. Pour them on top of the red chillies on the plate so they are kept warm enough till grinding. Now, add ghee to the kadai followed by black peppercorns, roast on low-medium heat until the spluttering frequency reduces but does not stop. They burn quickly if you wait till the spluttering stops. Remove on to the plate. Then, add fenugreek seeds and dry roast on low heat until fenugreek seeds turn golden brown and aromatic. keep stirring to avoid burning them. Any more roasting will turn them very bitter. Remove on to the plate. Follow it up with cumin seeds and dry roast on low heat until aromatic and their popping frequency reduces but does not stop. Remove on to the plate. Add a few drops of oil, then cinnamon bark and hing and roast on low heat until aromatic. Remove on to the plate. Lastly, dry roast mustard seeds till they begin to splutter. Remove on to the plate. Sometimes, they may not splutter. When the spices have cooled to room temperature or just warm, grind all the roasted ingredients in a spice grinder or any Indian mixer (dry jar) to a fine powder. Let the grinder jar cool completely before opening. If opened sooner, the oils and aroma will escape. Transfer to an airtight jar and store in a cool dry place. AVOID dry roasting all ingredients together as it results in uneven roasting or burning of ingredients. If you wish to make a smaller batch, a 4:1 ratio should work well between coriander seeds and cumin, fenugreek and black pepper. Adjust proportions for the other ingredients accordingly. Avoid dry roasting red chillies (without oil) or they'll emanate pungent, choking fumes. If you feel the spice mix turned out to be short of red chillies or doesn't taste hot enough, you can always adjust by roasting some extra chillies, grind to a fine powder and grind again together with the mix to get it all mixed well. If you use the powder sparingly, consider storing it in the freezer. That way, the spice mix will retain all of its flavor without tasting like wood husk. SSP brand hing is available in Bangalore - Mysore areas as far as I know. LG brand is available even in the US. Chana dal or any dal is not used as the mix tends to spoil faster. Chin, So thrilled that u like it! Gosh! The kind of confidence and trust you have on my recipes, you make me smile every time I read your comments. Really happy they live up to your expectations.. I HAVE to keep up the pace on the gojju and PuLiyogare.. fingers crossed! Sounds delicious and the pictures are amazing! Thank you for sharing. Beautiful pictures! This spice seems simply astonishing. I look forward to trying it! Sooo in love with your photos!! Nash, Thank you! How sweet of you! i just loved the clicks, I could not take my eyes of the gorgeous photographs! love the rustic styling. Thank you so much Simi for your kind words. Radhika, your pictures are works of art..stunningly beautiful 🙂 Love looking at all of them. They are a major distraction for me to actually read the recipe 😀 Please keep them coming. God bless. You are very kind.. Thank you..
Radhika, this post totally made my day. Puliyogare is one of my mum’s well-known specialities, a recipe passed down from her Mum. I’m ashamed to say I have never even tried to make it……I guess I know that it won’t be as good as hers. Love your writing and pics too. I am so happy to just read that, Deepa.. Thanks for writing..
Hope you do and discover that part of your mum in you.. Here, if I need to eat good PuLiyogare, I better make it myself! Necessity..
Urvashi, It is worth giving a try. Hope you do. What beautiful photographs my friend! I did not know about this spice mix but then I’m no expert in South Indian cuisine. But the sound of it sounds SO good. I’m definitely making this for my spice collection! More than the spice mix is the rice that is made of it – PuLiyogare. If you lived near, I would make it for you to taste! As usual superb write up and beautiful clicks. One question can I use this pudi to make saru…the ingredients are almost similar cinnamon excluded. Hope u don’t delay to post gojju preparation . You are right. It is very similar to Saaru Podi, but there are subtle differences. I would say, in case of an urgency or when you have little choice, when you have no Saaru Podi, you can easily sub this for that without much harm. hi, u don’t use turmeric for this ? and what about tamarind ? when to use that ? Turmeric is a part of the original recipe. I have skipped it because I do not have dried turmeric root, which is used. 1/4 tsp of turmeric can be added while grinding the spices. This recipe is only for the spice mix. Tamarind paste and actual PuLiyogare recipe will follow in subsequent posts. Thanks for your reply…. u mean we cannot use this to mix with rice and eat it ? Thank you for your kind words.. you encourage me..
Puliyogre is always a hit at home. But never dared to make it from scratch. Thanks for sharing. Lovely photos. The 3rd one looks very unique! Thank you Harichandana! Glad u stopped by..
What kind of dish do you usually use this mix with? This looks very interesting? Mostly rice. It makes an amazing rice dish! Your photography is spectacular … I’m glad I found you! Awesome pictures! And I’m super excited to try this! where did you take the picture ? 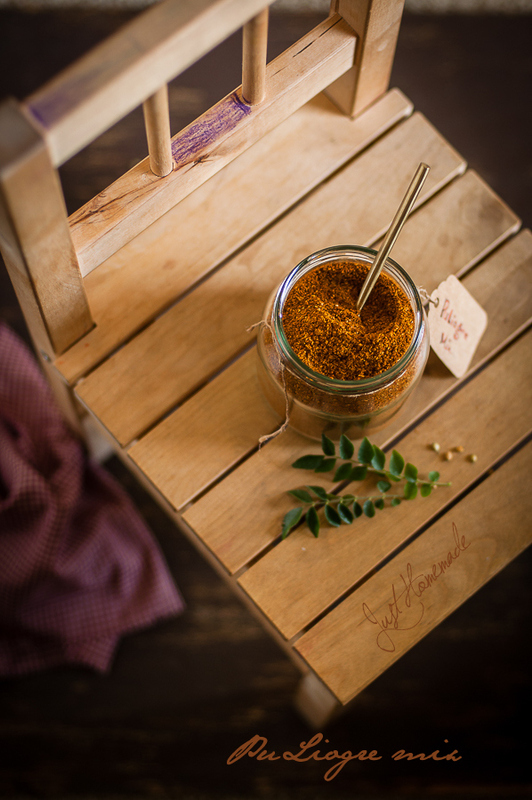 Homemade spices are so easy to make and intoxicatingly delicious! I have always been a fan of podi’s with similar flavour but I know that’s a sin to say as all my south Indian friends from different regions are absolutely clear on the fact that each spice mix is different even when the ingredients are same and ratios different 🙂 Bookmarking this. What a beautiful post!!! Came across your blog while referring some food blogs 🙂 Happy to connect…. Absolutely breathtaking photography and enjoyed the storytelling as well! Makes me want to convert to being a vegetarian! Your photography is fantastic! I especially loved the chair as a prop–so unexpected yet equally awesome! Never heard of this mix before, but it is interesting to try it if it seems so important in South Indian cuisine. When you see first pic, you ask yourself; what’s that? How this is made? But than you see all the ingridients on other pics, and all you can say is wooow. All this in one jar 🙂 Nice pictures and thans for this great recipe! That spice looks great. I haven’t made spice blends before, but this looks like it is definitely worth the effort. The photographs & recipe are interesting.I’ll try it soon.But I have a doubt – I had heard before that white til (sesame) is an essential ingerdient in puliogare.Is it ok without it? This looks fantastic. I absolutely love the photo of the whole spices in the skillet! I’ve never heard of this spice blend, let alone make it, but I’m interested in trying it out. 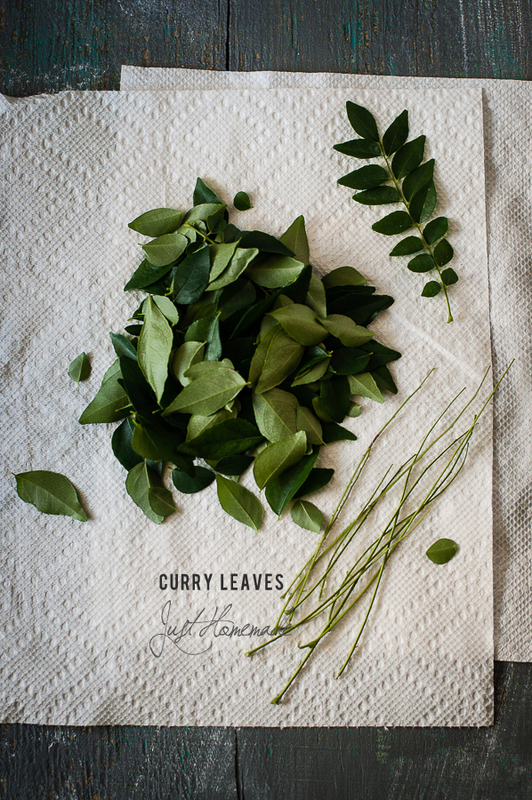 I’ve never seen curry leaves before, so that may be my limiting factor here. Thanks for sharing! I love the recipes but need more on how to go about wit the black sesame seeds n tak maria thanks a lot . I really liked your recipe for Puliyogare mix. Really nice work with the photography BTW, keep it up. procedure for cooking puLiyogare with this powder mix not published yet. Krithika, I do not know how to respond. Thank you for your kind words. I am humbled and honored. I am extremely happy if everyday cooking looks beautiful and inspires people to get into their kitchen. That’s what this blog is about – celebrating home cooking! And, when people like you take the time to tell me what you liked, it makes my day and fills me with renewed motivation.. I do hope you made/make the podi sometime.